Tonight’s recipe is Crab Bisque. Truth be told this one was one of my FREEZE-O-RAMA recipes from my last cooking day, but it never made it to the freezer ;). And some (1 T) Old Bay baby! Now grab three cans of crab meat… drain it, flake it and make sure to get any bits of cartilage outta there. Anyhoo, add the crabbiness to the soup, mix and heat through. Yummy for the tummy! So warm, rich and comforting… and the sherry and Old Bay were perfect additions! Do you chill, baby? What is your favorite thing to freeze? Pssst… Have you voted on my Goode Gooseberry Project decision? I will be using a lot of those Gooseberry Patch recipes in future FREEZE-O-RAMAs, so help me decide… purdy please??? Previous Post: « Help me choose! 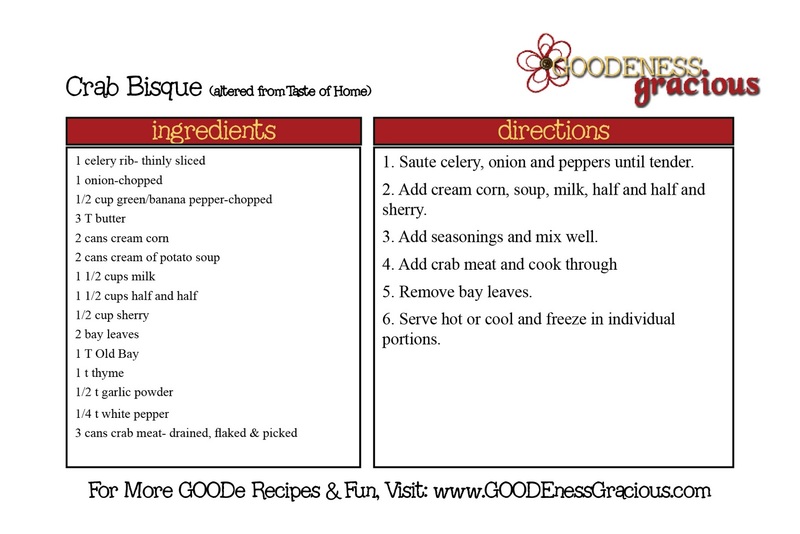 I will definitely try the crab bisque recipe!! With the cooler Fall weather comes soup season! I love taste of home recipes. Thanks for sharing! I'm pokin' around your recipes. I've gotten out of the habit of freezer cooking, but thinking I should get back to it. I really need to try that crab bisque. I don't think it would make it to my freezer, either! I made the crab bisque recipe today. I went with the original version and put it all in the crockpot. It was soooo yummy!! Next time, I will add and extra can of crab meat. I'll post about it on my blog later this week and will link back to your blog. Thanks again for sharing. Oh, that looks good! I love anything with crab in it. Normally I just clean out the pantry when making soup. People always ask for exact recipes since the soup is so good, but I never have one. Literally whatever I want to get rid of in the pantry goes in and it tastes good. Your crab bisque sounds delicious. And my goodness you were working hard to get all those things in the freezer. But how nice it will be to have dinner all ready on winter evenings!